The Society’s journal has been published continuously since 1893. It first appeared under the title Proceedings of the Malacological Society of London, but in 1976 (volume 42) it was renamed Journal of Molluscan Studies. Since 1986 (volume 52) the Journal has been published jointly with Oxford University Press. It is the leading international journal covering the biology of molluscs. 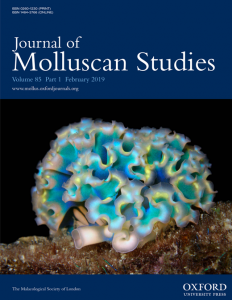 The Journal accepts research papers on all aspects of purely molluscan studies, including systematics, molecular biology, palaeontology, ecology, physiology, behaviour and others. Papers on applied malacology (e.g. fisheries, aquaculture, parasitology, neurobiology, biochemistry, biomedical studies, pest control etc) are considered if the mollusc is the focus of the study. Review papers on topics of wide interest are also encouraged. Short papers appear as Research Notes, which are generally methodological notes or brief reports of topical interest. The Journal is published in four parts each year and each annual volume consists of 400 pages. It is available in printed format and online. All back issues are also online in an electronic archive. It is covered by all the major indexing services and included in the Science Citation Index (ISI). The Chief Editor of the Journal is assisted by a board of Associate Editors, including about 25 of the world’s leading malacologists.